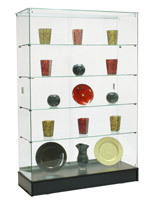 Trying to decide on which glass display case is best used in your exhibition area? 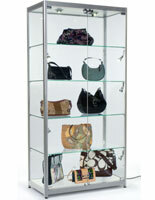 These quick-ship store fixtures have many great features. 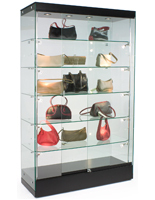 The glass display cases with lighting fixtures are ideal for highlighting special pieces that are being presented for purchase. 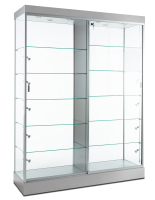 These retail showcases are ideal for displaying trophies, jewelry, electronics, sports memorabilia, and many other items for easy and clear viewing by customers because of their transparent fronts and possibly sides. 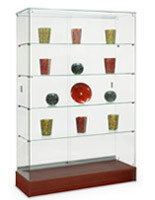 The glass display cases, like store fixtures, are able to be used in many settings, such as museums, schools, retail locations, residences, and countless others. 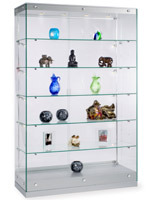 Some of these pieces can even be used in conjunction with one another to outfit entire settings with showcases for use with different items. 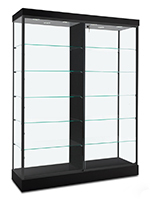 Why are these store fixtures labeled as quick-ship models? 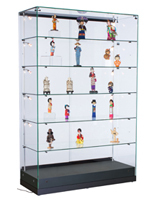 The glass display cases are shipped as they are received by us, be it fully-assembled or in pieces, which allows us to get your items to you faster. We have three large warehouses that give us the opportunity to keep large quantities of items in-stock and ready for fast shipping to you, our customers! All sports store fixtures in this category have quick-shipping and many will qualify to be shipped out the same day as ordered if done so by 1pm ET Monday through Friday and provided the items are in-stock. 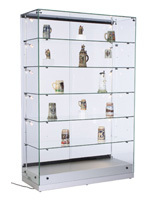 So a few features of these glass display cabinets were mentioned earlier, like the fact that they are quick-ship models, many have lighting options, and they offer clear views, but let's get deeper into these retail showcases, shall we? 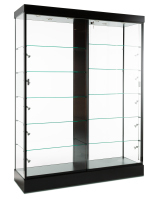 There is a wide variety of trophy cases offered here and so the features that are present with them become a much longer list. 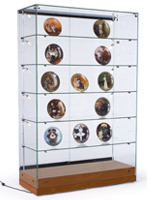 Many of these containers are tempered-glass display cabinets with construction that is usually paired with other materials, like melamine laminate or MDF, as bases for a frameless design or with framing corners for a more traditional look. 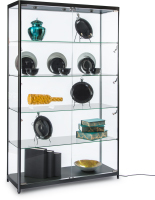 The colors and finishes are endless as well coming in shades like black, white, and silver, and finishes like cherry and wenge. 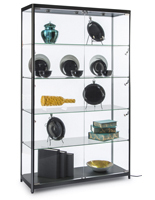 Many of these models lock from behind, some even have locking cabinets for storage purposes. 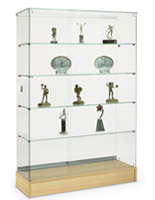 Several display cases have clear shelving that is either of a fixed height, meaning it can't be moved, or that is adjustable with moveable pegs for displaying larger trophies. There is also lighting present in many of these retail showcases that may be located on the top, sides, or possibly both and several include on/off buttons to save electricity during non-business hours.